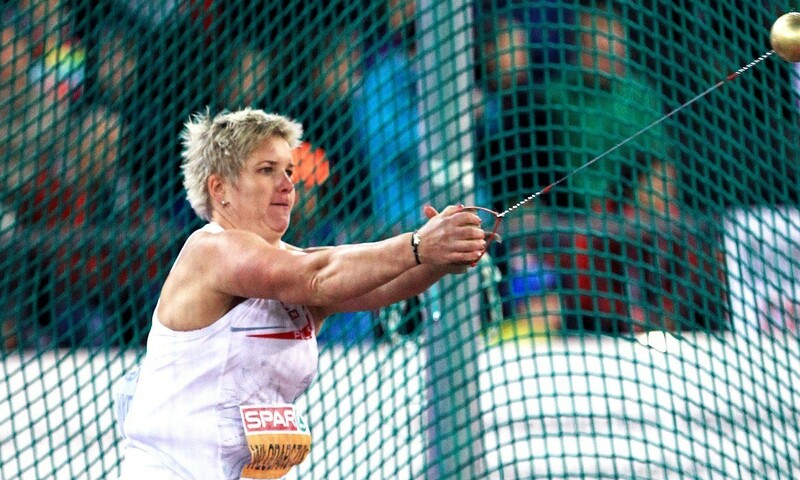 World hammer record-holder Anita Wlodarczyk set the fourth longest throw in history behind her own marks to extend her world lead and break the meeting record in Halle with 79.48m. Two days after winning in Ostrava, the Pole put together another fantastic series: 76.40m, 79.48m, X, 79.04m, 78.80m, 78.90m. Wang Zheng was second with 72.46m ahead of British record-holder Sophie Hitchon with 71.63m. The female throwers produced the best marks of the meet with Julia Fischer smashing her lifetime best in the discus with 68.49m in a competition which saw five throwers surpass the 64m line: Caballero 66.41m, Su Xinyue 65.40m, Feng Bin 65.14m and Nadine Muller 64.30m while Yang Chen won the B competition with 63.61m. Gong Lijiao set a world lead and lifetime best of 20.43m to win the shot put ahead of team-mate Gao Yang (18.72m) while Christina Obergfoll won the javelin with a season’s best of 64.96m ahead of Mathilde Andraud who set a French record of 63.54m and European under-23 champion Christin Hussong (62.32m). On the men’s side, Pawel Fajdek just missed his world-lead with 80.39m in the hammer ahead of Dilshod Nazarov’s 78.34m. There was a German one-two in the javelin courtesy of Julian Weber (82.69m) and Johannes Vetter (81.53m), while Qatar’s Ahmed Bader Magour set a national record of 80.90m in third. Christoph Harting and Daniel Jasinski were first (65.61m) and second (65.38m) in the discus while Konrad Bukowiecki won the shot put with 20.62m ahead of David Storl (20.25m) less than twenty four hours after improving his world junior outdoor record to 21.01m to win in Ostrava. Britain’s Harry Hughes recorded the third-best ever throw by a British junior, throwing the 800g javelin 75.46m. The start lists for the Gotzis Hypo Meeting on May 27-28 have been confirmed. The decathlon field is led by world silver and bronze medallists Damian Warner and Rico Freimuth and reigning champion Kai Kazmirek. The heptathlon field includes four of the top five finishers from the World Championships (Theisen-Eaton, Ikauniece-Admidina, Broersen, Rath) along with last year’s runner-up Carolin Schafer, plus 2014 winner Katarina Johnson-Thompson. Georganne Moline made her 400m hurdles opener with a win during the Elite Classic meet and her 53.97 is new world lead. Second was Dalilah Muhammad 54.64 and third Canadian Sage Watson with a 54.82 PB. In the women’s hammer, Gwen Berry threw a US record with 76.31m for the second best mark in the world this year behind Anita Wlodarczyk. Also a good shot put competition was won by Jordan Clarke with 21.11m over Darrell Hill’s 20.94m PB with Reese Hoffa third 20.83m and Ryan Whiting fourth 20.11m. Tavis Bailey topped the discus with 64.94m ahead of Nate Moses 64.26m, while Cyrus Hostetler won the javelin with 83.83m ahead of Benjamin Woodruff 80.86m (lifetime bests for all four). Melissa Bishop won the women’s 1500 m at the Running Factory Open meet in a 4:09.58 PB. There was good depth in the men’s 1500m which was won by Hamish Carson of New Zealand with 3:36.65 over Nate Brannen with 3:36.84, another New Zealand runner Julian Matthews with 3:36.94 and Briton Lee Emanuel with 3:37.10. Olympic winner Sally Pearson was back racing at a local meet in Gold Coast, clocking 12.75 at the 100m hurdles. It was the Olympic champion’s first race after 11 months through injury.